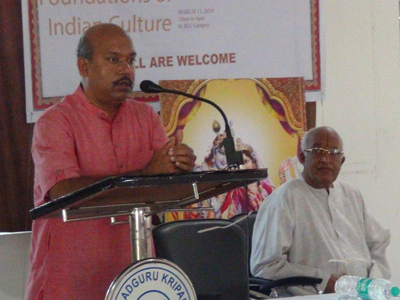 Sri Aurobindo Foundation for Indian Culture (SAFIC), Sri Aurobindo Society, Puducherry, and Jagadguru Kripalu University (JKU), Cuttack, jointly organized a one-day seminar at the JKU Campus on March 11, 2019. 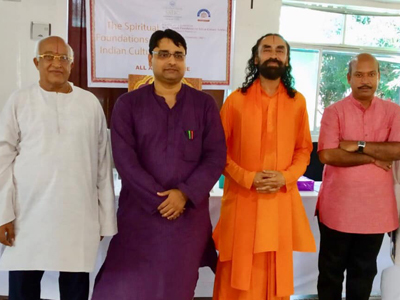 The Seminar was inaugurated by Swami Mukundanandaji, founder of JKU, by lighting the lamp and an introduction to the seminar was given by Dr Sampadananda Mishra, Director – SAFIC. Dr Mishra spoke first on the Fundamentals of Indian Spiritual Tradition. The entire speech was in Hindi. Next Swami Mukundanandaji spoke on ‘Spirituality – The Master Key of Indian Mind’. Swami-ji also spoke in Hindi, and in his speech he highlighted the immense contributions of the seers, sages and acharyas in building the spiritual foundations of Indian culture. After the lunch break, Dr. Krushna Keshab Sarangi spoke eloquently in Odia on ‘Dharmo Rakshati Rakshita’ in which he explained in detail the various definitions of dharma given in the tradition. Professor Ramaratnamji, Vice Chancellor of JKU, was the last speaker of the day who spoke on the topic ‘Sanskrit – A Vehicle of Indian Culture’. In his speech, Professor Ramaratnamji spoke on the gamut of Sanskrit literature and explained how Sanskrit has been the language through which India has been expressing its creative mind in all ages. A summary of the first two sessions were presented by Professor Ramaratnam ji and the synopsis of the last two sessions were presented by Dr Sampadananda Mishra. The seminar ended with the valedictory remarks by Swami Mukundanandaji.